ReSharper 6 EAP has been available for about 1.5 months, and it’s time to move on zooming into new features that this new version brings. The same technique can be applied to properties. -webkit-border-top-left-radius anyone? ReSharper provides completion for all kinds of selectors, including elements, .classes, #id’s, [attribute]s, and :pseudo-elements in CSS files. Both ReSharper and Visual Studio provide completion for properties and values in CSS files. However, ReSharper code completion supports lowercase CamelHumps, letting you complete background-color by only entering bc. Both ReSharper and Visual Studio complete usages of CSS classes in markup files but ReSharper goes further by completing usages of id’s. Naturally, the majority of ReSharper refactorings are not applicable in CSS, but some of them could work there just fine. The first refactoring to be provided in CSS is the Rename refactoring. With ReSharper 6, you can rename a class selector — both from its declaration in a CSS file and from its usage in markup files. A couple more CSS-specific refactorings are in the works, as well as other nice CSS support features here and there. 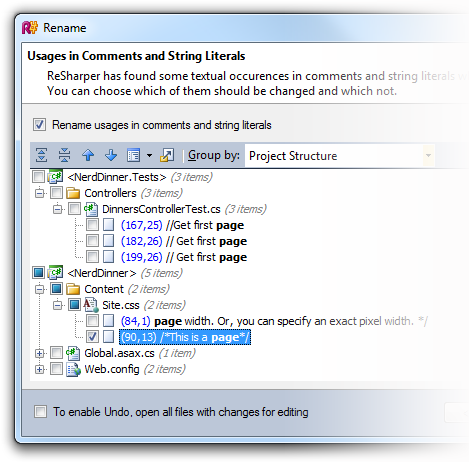 Download ReSharper 6 EAP builds and explore the goodies! This entry was posted in How-To's and tagged CSS, ReSharper, ReSharper 6. Bookmark the permalink. I especially like the Rename refactoring. Another one that would be useful (to me, at least) would be an “Extract CSS class” refactoring that would allow you to highlight an inline style and “extract” it to a class in your css file. OMG OMG, the color picker I asked for ! OMG OMG THANKS GUYS ! When is the release ? I wanna upgrade ! PS2: Would it be possible to add another tab to color picker that list all colors in current document ? The release is currently scheduled for late Spring. Are there any plans to support LESS? I don’t care a whole lot about full support, but it would sure be nice if it could at least bring highlighting and code completion support into .less files and have it handle nested rules. 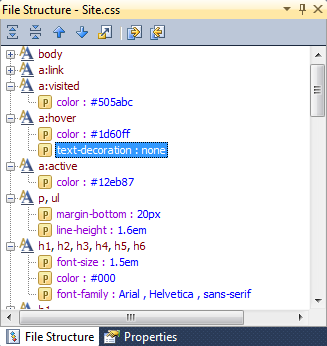 Visual Studio’s highlighting and code completion gets completely confused by nested rules. No, no such plans yet. Can you point me to a publicly available project that uses LESS extensively so that we can take a look at it to determine the scope of work? Good idea! I can’t commit to anything but we’ll consider implementing it. it’ll be awesome if you integrate zencoding. thanks! I’d really love the feature Roland suggested. Usually when create the design in CSS I have a set of colors I use, 3-5 colors. Right now I have to remember and find the last placeI used it and copy paste it. It would be great if I had that tab and could simpy select it from the list! Another nice to have feature is a small thumbnail preview of background images when you hover over the path name or property. I’m sorry, I don’t know of any .NET projects that are publicly available that currently use LESS extensively (though I’m sure they exist). We use it extensively here at my company, but the code is not publicly available. RubyMine recently added LESS support though so you maybe you could talk to your colleague’s who developed that to get a rough idea of the scope. We’re not planning to integrate zencoding into the main product. Do you experience any difficulties using it via a powertoy? 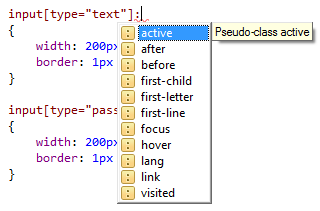 Preview for URL resources in CSS is planned but I’m not sure whether it will be implemented for ReSharper 6. LESS is becoming ubiquitous in many projects rapidly. I vote using my hands an legs for this feature. We also use dotLess. I figure it’s a long shot, but some support for LESS would be so greatly appreciated. That alone could convince our entire office to get licenses. +1 for dotLess support. I use it extensively. I then convert it to css files either via T4 (http://haacked.com/archive/2009/12/02/t4-template-for-less-css.aspx and http://blog.waynebrantley.com/2009/12/ultimate-automatic-stylesheet-combining.html) or via NAnt build target. Either way, knowing the CSS is wrong in the .less file is much more helpful than analyzing the css file once transformed. Will ReSharper 6 support lessCss files (www.lesscss.org)? We’ve used Less in our latest project and it’s awesome for making CSS more maintainable etc. Nice!! I’m looking forward to these new features. * Combine 2 style sheets into one & automatically group similar styles together taking into account the order the style sheets are included in the (web)page. * CSS stylesheet minimalisation during the publishing of a site. 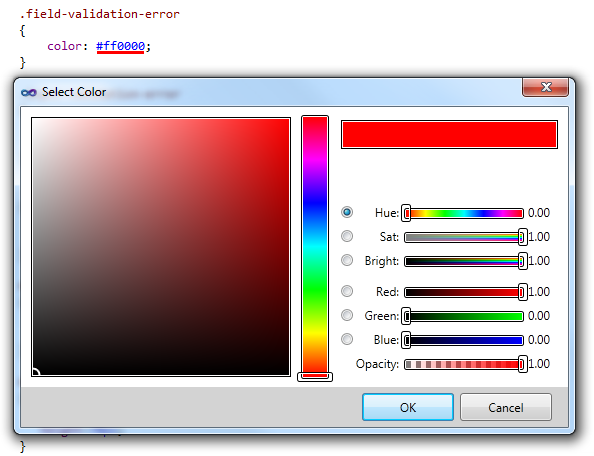 * Detection if a color can be converted to a “web safe color”. Looking great. I would also like to see the ability to use an equivalent of #region in css files to break the file into sections. Along with some sort of window or keyboard shortcut to quickly navigate the different regions it would save an awful lot of scrolling. Thanks, I’ll pass your suggestions to the developers. No commitments yet though. I think I just blew up from excitement. The level of joy I feel cannot be appropriately expressed in actual words in public forum. @Roland: As a side-note, using .less files in your project will eliminate the need to see or remember all the colors used in your style sheets. With less you would just create variables for your colors (i.e. @primaryColor, @secondaryColor, etc. 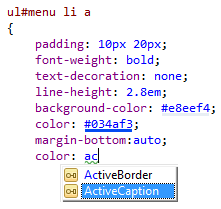 ), then just use them throughout your styles. You can even use them as the base for other colors (i.e. background-color: lighness(@primaryColor, -25%) will give you a color that is 25% darker than @primaryColor). I’m soo looking forward to get it. Another vote here for for .LESS support. File Structure and Find Usages are very cool on supporting CSS ! But I had a lot of CSS files in Project and I don’t know how many .classes haven been used. Finding usages one by one still takes too much times. Could you sense it automaticly and make the useless class in gray color or something like that, just like you do in cs files. This action may take a long time, so you can also make this as a scan function way instead of IntelliSense way. We’re looking to implement highlighting for unused classes. Not sure if this will make to the initial 6.0 release but this is definitely on the radar for us. Definitely would be awesome if you could create a “CSS Sweep” feature that basically compares CSS files to all classes used in *.aspx pages in the solution and then automatically lists the unused ones so you can remove them ? Currently, we have huge CSS sheets of >5000 lines and finding unused classes is a massive pain. There isn’t any plugins or known features I know about that would enable you to easily “cleanup” your CSS style sheets so ANYTHING you can add which would make this automated would be a HUGE +1. One more vote for .less support. I use less in all my projects now. LESS support would make this feature more useful for me. Another +1 for LESS integration. Seconding the LESS support request. I just starting using it, serving it up via LessCoffee. It’s easy as pie and really cuts down the duplication and clutter. I’d be willing to shoot over my sandbox project. +1 vote for Less. Please guys! And yet another +1 for LESS support. ReSharper CSS class name renaming not work propetly.